The show held in the Rotherfield Village Hall was both well attended and and full of more exhibits than ever. 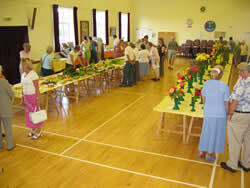 A fabulous display of flowers, fruit, vegetables and handicrafts were displayed, judged and awarded. The gardeners managed to put on an excellent display despite the unseasonal wet weather we have been experiencing this August. 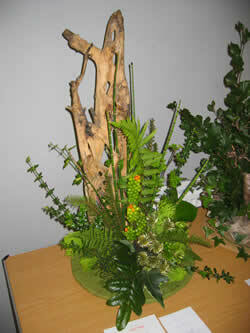 In the flower arranging sections, some truly imaginative creations were to be seen. The exhibit below was eye catching being made entirely of green materials collected from the garden. In the flower and vegetable sections, Mark Cross residents won a number of firsts, seconds and thirds. The tea room was busy all afternoon, offering a range of cakes and beveridges, allowing villagers to exchange tips and views on the exhbits, not to metion gossip! At 4pm, the trophy presentation took place, where a range of silverware was awarded to the worthy winners. This type of event really illustrates what village life is all about, why don't you have a go and enter a class or two next year?